In this work, we propose to explore the use of photo generated carriers to selectively promote the etch rates of silicon. Our premise relies on being able to use an intense laser beam to generate excess holes in the silicon, which then diffuse to the surface to produce the dissolution of silicon. The steady state hole concentration is largely a function of the substrate doping and temperature. In p-type silicon it can be as high as 1020cm-3, or it can be as low as 103cm-3 in n-type silicon. 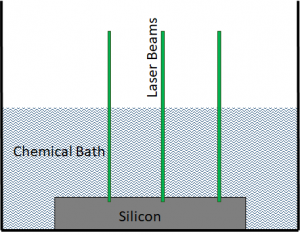 By illuminating the silicon with a laser beam with wavelength smaller than 1100nm, the hole concentration in an n-type silicon can be raised by several orders of magnitude. The wavelength controls the depth of penetration. Shorter wavelength (a 532nm green laser) will excite a smaller volume compared to a 1064nm infrared laser. The intensity controls the total number of carriers generated. The generated holes can reach the surface by carrier diffusion, or they can also be accelerated by electrically biasing the silicon substrate compared to the chemical bath. The hole diffusion length in silicon can range from several hundred microns to less than a micron depending on the doping density. Therefore, for heavily doped substrate where recombination rates are high, electrical biasing may be necessary to ensure that most of the photo generated carriers reach the surface.